GOLD PRICES slipped on Monday with Asian shares nearing nine-month highs, as optimism grew on a US-China trade war resolution while Trump continued to hit out at the Federal Reserve, writes Atsuko Whitehouse at BullionVault. Spot gold dipped 0.3% to a 13-day low at $1286 per ounce as the dollar index, a measure of US dollar’s value relative to a basket of foreign currencies, also edged down 0.1%. This morning Asian shares gained after the S&P 500 Index on Friday came within 1% of a new all-time high. European markets also ticked higher despite concern over possible tariffs. The European Commission drew up a list of US imports worth around €20 billion ($22.6 billion) that it could hit with tariffs over a transatlantic aircraft subsidy dispute, EU diplomats said on Friday. Gold prices for European investors dropped 0.5% to 5-weeks low at €1137 per ounce while UK investors saw gold fall 0.6% to £982 per ounce, the lowest for more than week. “Stocks bulls certainly have the wind at their backs with improving growth but steady inflation, reduced trade tensions and a solid/better-than-feared Q1 earnings season,” a JPMorgan analyst said in a note. Adding to trade relief, it was reported that US negotiators had tempered demands that China curb industrial subsidies as a condition for a deal after strong resistance from Beijing. President Donald Trump renewed his attack on the Federal Reserve over the weekend tweeting that the, stock market would be “5,000 to 10,000” points higher had it not been for the actions of the US central bank. 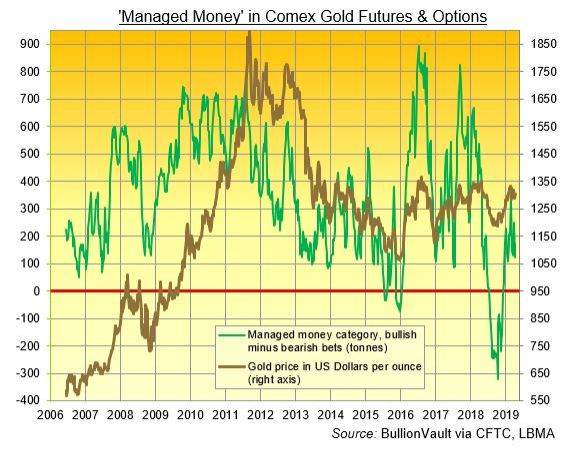 Latest data shows that hedge funds and other money managers last week increased the net long position in Comex gold futures and options 42% to 173 tonnes, according to US regulator the CFTC. In contrast, the largest gold ETF, the SPDR Gold Shares (NYSEArca:GLD), shrank last week to 758 tonnes, its smallest size since 9th November 2018, losing 3.8 tonnes as shareholders liquidated stock. On Sunday both Theresa May’s government and the opposition Labour Party stated that their talks represented the best chance of finding a Brexit solution and ending months of deadlock. However, talks between Labour and the government are unlikely to advance much further in the coming week unless Theresa May moves on her red lines over a future customs union, sources close to the talks have suggested. Parliament is in recess until April 23, but the negotiations will continue. Silver prices edged 0.2% lower while platinum fell further 0.4% from Friday’s close and 3 % from the 13 month-high at $915 per ounce, recorded last Monday.